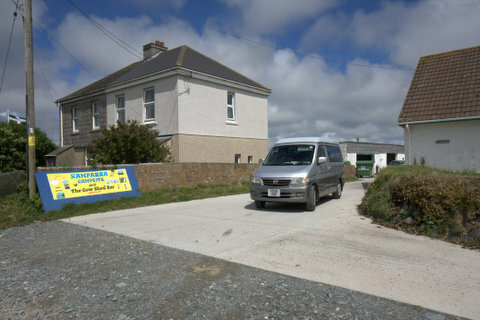 Campfires: A Cornish shovel is provided to dig firepits (look next to toilets). Wood: Is sold at reception and delivered in the evening, sometimes need a bit of prodding to get the wood delivered in reasonable time. £4 per good sized bag, decent logs. Ps You might need an axe. 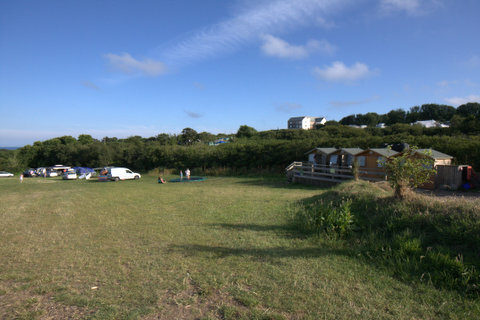 Facilities: Toilets and showers, under cover washing up and launderette area. Trampoline for the kids. Bar area. After the long journey down to the Lizard we rolled into Namparra and to be honest we very nearly turned around and left. The entrance is not inspiring. The bar area is dishevelled with mismatched furniture and scrubby grass out the front. The garages at the side are crammed full of junk that is literally spilling out the doors. However, I had expected ‘rough and ready’ so we ploughed on to the camping field. The sea views I had hoped for where only visible for the top of the field and then only a narrow strip of blue. 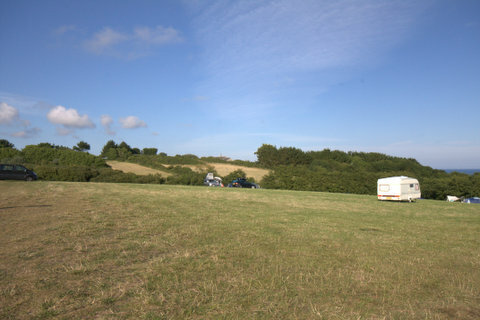 Much of the field was sloping, the best pitches seeming to be around the edges but not much space for us so eventually we found a flatish spot near the middle of the field. Next door could be clearly seen another campsite (Chy Carne) and I admit to feeling tiny bit jealous of their lush green grass as opposed to the straw like pasture beneath our feet. 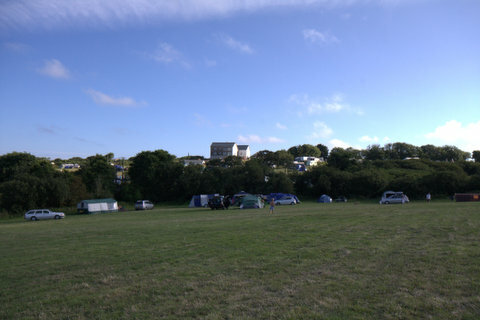 However, as the days passed and the tents and vans massed on that campsite ours retained plenty of space for ball games despite also becoming more full. In fact, as the days passed we became increasingly fond of Namparra. The huge trampoline set into the grass was a beacon for children and ours quickly made friends with other children. The campers in general where friendly and relaxed and all was quiet by 11pm despite some pretty large groups and lots of campfires. Ball games a plenty were played on the spacious field and to top it all the very lovely family friendly beach, Kennack Sands, was only a few minutes drive away. On the first evening the girls and I walked down to the beach along the narrow roads. 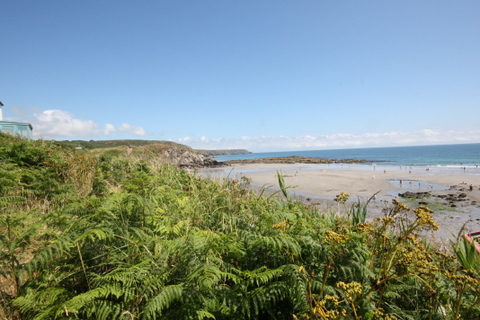 It is not a short walk, especially if carrying beach paraphenalia, and the narrow lanes mean we were often squashing ourselves into a prickly bush to allow a car to pass. However, by car it is only a few minutes drive and there is lots of parking, two cafes, a surf school, life guards and lots of happy families. Great for boogy boarding too! Check tide times, the beach has a very large tidal range. A word about the toilet/shower facilities. There is a series of wooden huts each of which house a shower and a toilet together. Good news for showering as you get loads of space, however there is no separation between the toilet and the shower so the floor is constantly soaking wet and often muddy or grassy. The toilets themselves were reasonably clean, it was the wet floors that were a little wearing . They seemed quite new, I fear overtime the constant wetness and lack of general maintenance might create issues. 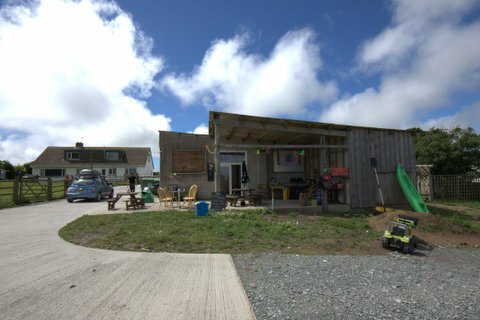 The bar ‘The Cowshed’, we didn’t use it as a bar, just went there to pay for wood and buy milk. It is an eccentric place but people in there were friendly and not at all intimidating. It seemed a bit like the owners just had all their friends round for a drink each night. It is also along way from the camping field so no concerns about noise. The campsite next door was fairly loud, though not amplified music just lots of people. I would have preferred it if we had felt more isolated. However, in this area close to a good beach there is a high density of holiday parks etc and for my money I would prefer to have been at Namparra than at any of the other sites. What’s nearby? In terms of food shopping Lizard village is the closest, including a post office where you can get money out. St Keverne is a very lovely little village the other side of the Lizard with a small supermarket which is open til 8 every day plus a butcher and a bakery. For full on Sainsbury’s you will need to go back to Helston. 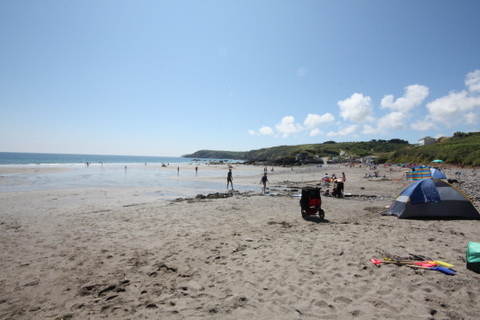 There are more beaches than you can shake a stick at on the Lizard. 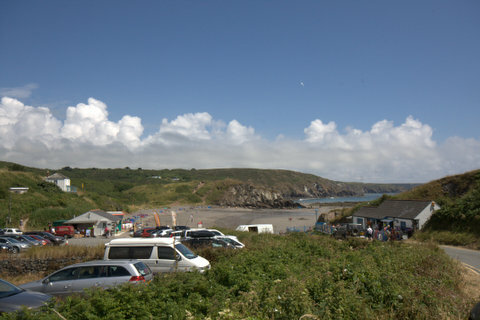 Our favourites are Kennack Sands for ease and Kynance Cove for sheer beauty plus the best sandcastle building sand and a great cafe selling ENOURMOUS pasties and sausage rolls (it is a bit of a walk from the car park though). This area is awash with pretty spots and little coves depending on how adventurous you are feeling and how you feel about driving around endless cornish lanes (we love it). The side of the Lizard towards Helford is less visited and feels very remote. We explored some of the smaller stony coves and revelled in the lack of crowds, we also visited Helford which is postcard picturesque and a great place for boat enthusiasts. In summary, Namparra is a very reasonably priced, basic campsite in a great area with a friendly vibe and a lovely local beach. Not exactly a hidden gem but a good option if you prefer space and campfires over fancy facilities and soft grass. The toilet/showers and trampoline, plus the other campsite in the background. 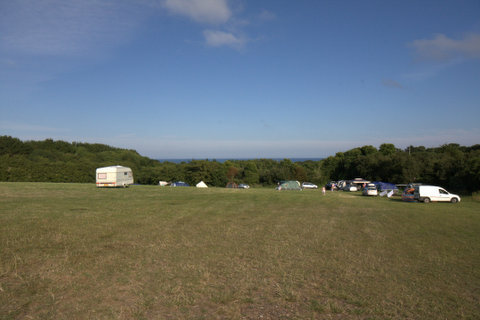 Namparra camping field with Chy Carne Campsite in background. Namparra soon after we arrived. It did fill up a bit over the next few days. Good to know! We haven’t ventured as for as Cornwall yet in the van, apart from a weekend at Padstow last year, but I don’t think it will be long. I love Kynance Cove.